In a busy year for Samsung, they’re back with perhaps their most exciting release of the summer – the Samsung Galaxy Note9. There are plenty of great features, including the very smart, new-and-improved S Pen. So, no more messing around – let’s dive right into the brilliant Note9. Well, the first impressions are good. The shape and size of the Note9 is fairly similar to the Note8, but it’s got even thinner bezels which means you get even more of that amazing Infinity Display, which covers almost the entire surface and is the largest ever. Take it from us, your videos are going to look truly epic. We really don’t think it’s going over the top to call the S Pen ‘famous’. It’s probably the best stylus out there – it’s certainly changed the game. So why so good? Well, it’s been given an upgrade for the Note9. Redesigned to make writing and drawing more accurate, and now equipped with Bluetooth technology, which brings new possibilities. For example, you can use it as a remote clicker to give your presentations a professional touch, and it also works as a camera shutter button up to 10 metres away. 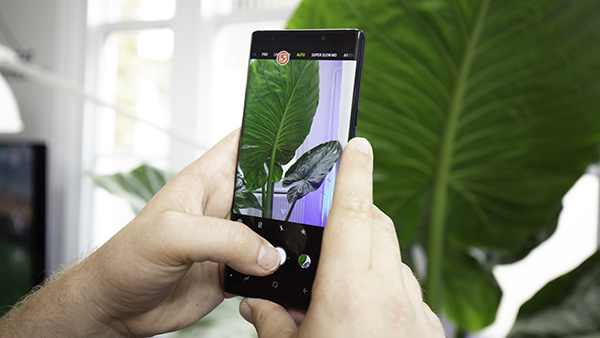 So, you can take great selfies without your arm taking up a chunk of the photo. 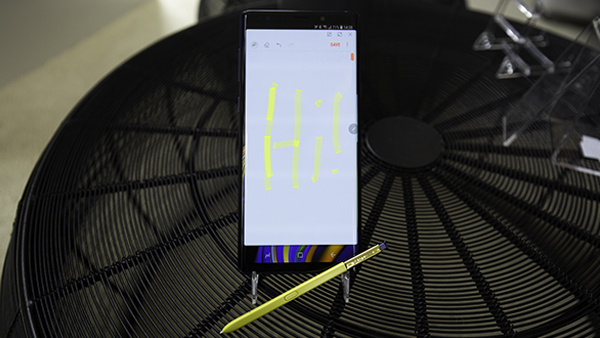 And then there’s all the other cool S Pen stuff… things like jotting down notes without needing to unlock your phone, getting creative with accurate doodles and drawings, and easily highlighting text to cut and paste. You’ve told us in the past how it can be annoying not knowing where to put your stylus when you’re finished with it. That won’t be a problem with the Note9’s S Pen – there’s a handy slot to pop it into, and that’ll start recharging it, too. The phone detects when the S Pen is removed from the slot, automatically bringing up a range of handy options. You’ll have a lot of fun using the Note9’s camera. Its dual aperture works like the human eye – adapting your shots so they look cracking in any light. And there’s Camera Scene Optimiser which, in plain English, means the camera recognises your surroundings, and adjusts your settings for the best, most detailed shot. You’ll now get that one perfect shot without a stack of ‘practice’ shots clogging up your storage too. The AI camera will alert you to a smudge on the lens, if someone has blinked in the shot, or if the image has come out blurry. You’ll even be able to record stunning footage in 4K, so your holiday videos will look great on your TV. Finally, let’s see what’s going on inside the Note 9. Well, it’s a powerful beast, with an ultra-fast octa-core processor and up to 8GB RAM to help you get more done. The battery is a monster and will help you go further in the day. The 4,000mAh battery is about as good as you’ll get anywhere, and 20% bigger than the Note8. And when it comes to inbuilt storage, there’s a shedload. Choose from 128GB or a frankly massive 512GB. Still not enough? A microSD card will give you even more space, so you can keep all your videos, photos, apps and games. The Samsung Galaxy Note9 is out now – and you can get your hands on one. Buy it here. And check out our hands-on video below!